According to the Bureau of Justice Statistics, there were 15,388 state and local law enforcement agencies, employing more than 750,000 sworn officers in 2013 (the most recently available data). The majority of these agencies were local municipal police departments (12,326). There were 3,012 sheriff’s departments, which serve areas of the country that do not lie within the jurisdictions of police departments of incorporated municipalities, though some small cities contract with the local sheriff’s department for police services. There are also 50 primary state police agencies. 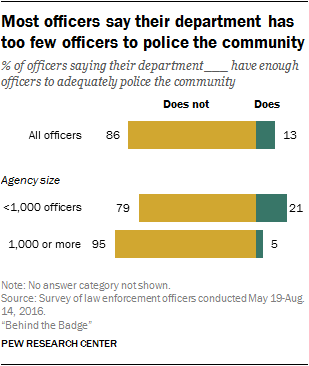 The Pew Research Center survey conducted by the National Police Research Platform is representative of officers nationwide in local police and sheriff’s departments with at least 100 full-time police officers. A majority of full-time sworn officers (477,317) were part of local police departments in 2013. 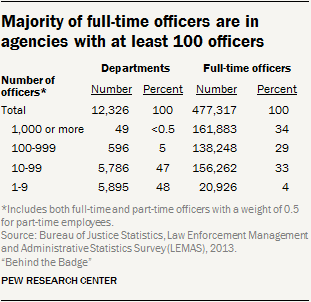 Agencies with at least 100 full-time equivalent officers employed 63% of the nation’s full-time officers even though these departments accounted for only 5% of all local police departments (or 645 departments). It is these larger local police agencies that have been at the center of recent national conversations on policing. In 2013, more than a quarter (27%) of full-time police officers were racial or ethnic minorities. Some 12% of full-time local police officers were black; another 12% were Hispanic; and 4% were Asian, Pacific Islander, American Indian or multiracial. By comparison, 12% of the U.S. adult population was black; 15% was Hispanic; and 8% was some other racial or ethnic minority in 2013. Women remain underrepresented in the field, making up just 12% of full-time officers in 2013; women are 51% of the U.S. adult population. In general, departments that serve larger populations are more racially and ethnically diverse and tend to have a higher share of women serving as full-time officers. For example, more than four-in-ten officers serving populations of 500,000 or more were racial or ethnic minorities in 2013, compared with fewer than one-in-five in jurisdictions with less than 50,000 people. 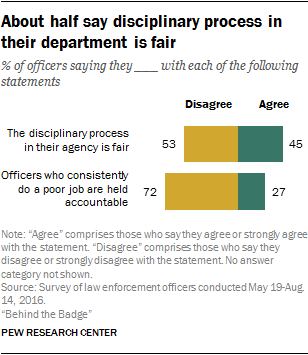 About half of black officers (53%) say that whites are treated better than minorities in their department or agency when it comes to assignments and promotions. 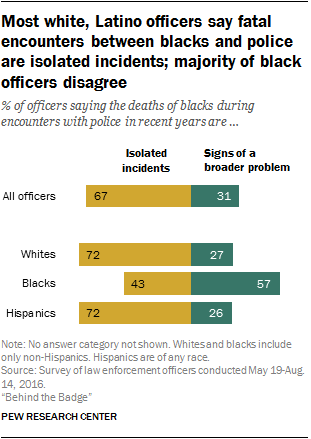 Few Hispanic (19%) or white officers (1%) agree. 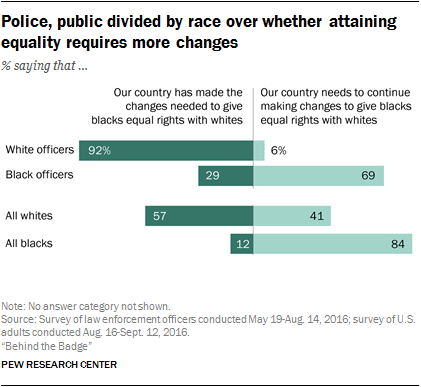 About six-in-ten white and Hispanic officers say minorities and whites are treated the same (compared with 39% of black officers). Most officers say that outside of required training, they have not discharged their service firearm while on duty; 27% say they have done this. Male officers are about three times as likely as female officers to say they have fired their weapon while on duty – 30% of men vs. 11% of women. Roughly three-in-ten officers (31%) say they have patrolled on foot continuously for 30 minutes or more in the past month; 68% say they have not done this. Officers are divided over whether local police should take an active role (52%) in identifying undocumented immigrants rather than leaving this task mainly to federal authorities (46%). 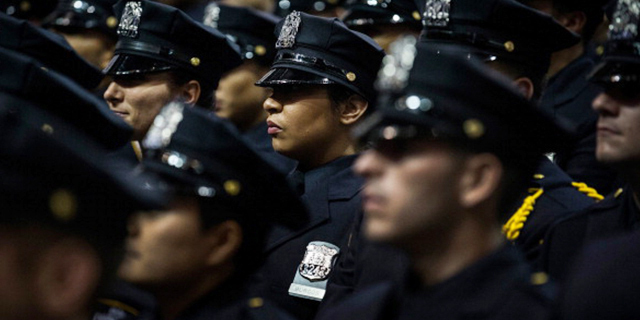 The share of sworn officers who are women or minorities has increased slowly in recent decades. Since 1987 the share of female officers has grown from 8% to 12% in 2013, the last year the federal Department of Justice measured the demographic characteristics of police agencies. During that time, the share of black officers increased from 9% to 12% while the Hispanic share more than doubled, from 5% to 12%. 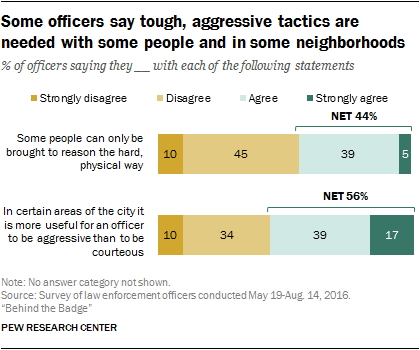 About seven-in-ten officers say some or most of the people in the neighborhoods where they routinely work share their values and beliefs. Officers in larger departments are less likely than those in smaller departments to say they share values with the people in the areas where they patrol. 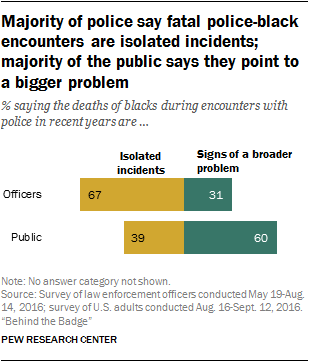 About half (51%) of police officers compared with 29% of all employed adults say their job nearly always or often frustrates them, while about four-in-ten officers (42%) and half of employed adults (52%) say their work frequently makes them feel fulfilled. A large majority of all officers (76%) say that responding effectively to people who are having a mental health crisis is an important role for police. 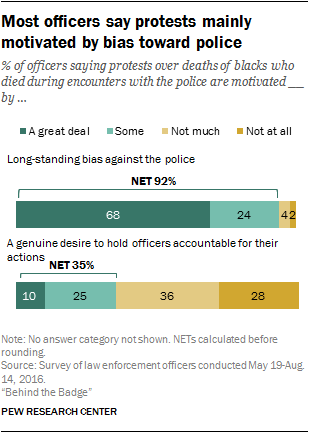 An additional 12% say this is a role for them, though not an important one and 11% say this is not a role for police. Throughout this report, “department” and “agency” are used interchangeably and refer to both municipal police departments and county sheriff’s departments. The terms “police officer” and “officer” refer to sworn officers in both police and sheriff’s departments. References to “officers” or “all officers” include rank-and-file officers, sergeants and administrators. References to rank-and-file officers include sworn personnel assigned to patrol, detectives and non-supervisory personnel assigned to specific units such as narcotics, traffic or community policing. Sergeants are first-line supervisors. Administrators are officers with the rank of lieutenant or higher, including senior command officers. References to whites and blacks include only those who are non-Hispanic and identify as only one race. Hispanics are of any race. References to urban and suburban police officers are based on the ZIP code in which their department is located. Urban police officers are defined as those whose department is within the central city of a Metropolitan Statistical Area (MSA). Suburban officers are those whose department is within an MSA, but not within a central city.